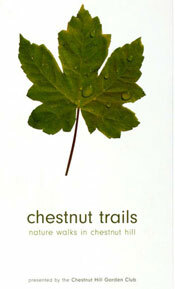 Chestnut Trails is the result of a project conceived by the Conservation Committee of the Chestnut Hill Garden Club in 2001 to bring attention to the wonderful nature trails in our area. 2000 booklets were printed, of which 1700 sold. Copies are still available through the Chestnut Hill Garden Club, PO Box 67442, Chestnut Hill, 02467, MA for $12.50 plus $1.00 postage. Please read and enjoy Chestnut Trails. We hope it will inspire you to take a walk.